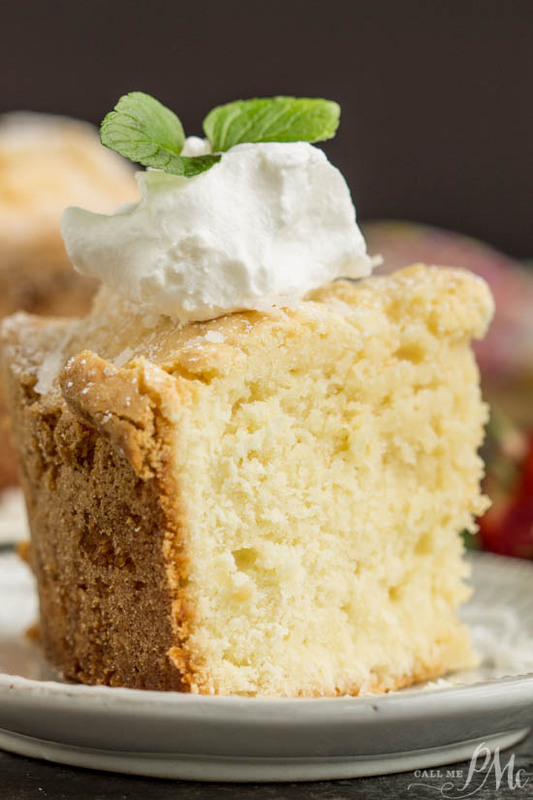 Of all the pound cakes I’ve made and shared with you, I had not even thought about a Coconut Pound Cake until this spring when two different readers asked about one. They both wanted a Coconut Pound Cake for Easter. 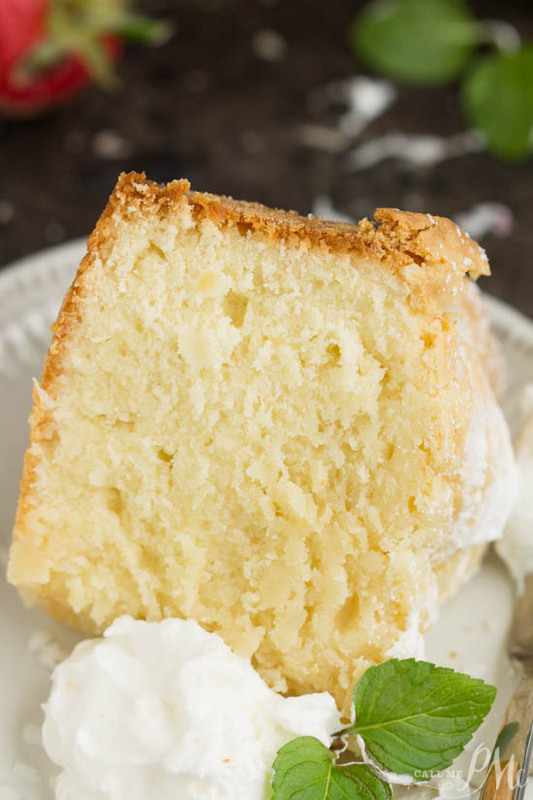 After a busy Track season, Boy Scouts campouts, and birthday celebrations I finally got to test and perfect this Coconut Cream Cheese Pound Cake. 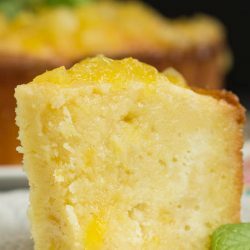 My most favorite recipe to make is pound cakes. I’ve made hundreds and shared over 30 with you. (You can find the recipes here, Pound Cake Series.) 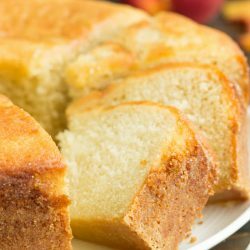 I do recommend you read How to Bake the Perfect Pound Cake as well as How to Calibrate your Oven to get the very best results for your pound cake baking. Most often, I’m asked ‘did you accidentally omitted the baking powder or baking soda’? One important note, traditional pound cakes did not contain baking powder or baking soda. 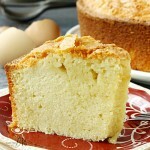 They were leavened simply with eggs and is my preferred method of baking pound cakes. Baking powder and baking soda change the texture (crumb) of cakes as well as, inhibit getting that nice crunchy ‘crust’ that is so desirable on pound cakes. As indicated above, I sprinkle confectioners’ sugar over the top. I then served the Sour Cream Coconut Pound Cake with fresh berries and whipped cream. You could frost it with Caramel Sauce or Cream Cheese Glaze and toasted coconut if you prefer. Brands I recommend Philadephia cream cheese, Crisco solid vegetable shortening, and White Lily or Martha White flour. Pans and more recommendations here. I have found solid vegetable shortening and sugar instead of flour to be the best for coating the pan with to prevent sticking. By using sugar instead of flour, you won’t have white patches on the cake. You can use flour if you prefer. If you use a bundt pan instead of a tube pan, make sure it’s a taller bundt, about 5 inches tall. 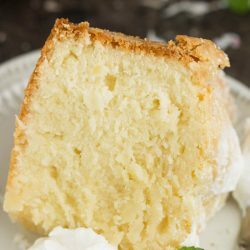 This Coconut Cream Cheese Pound Cake recipe is dense and buttery. It's topped simply with a sprinkle of powdered sugar then served with whipped cream and berries. Beat butter, shortening, and sugar together. Next add the cream cheese and blend until fluffy. Add eggs alternately with flour, beginning and ending with flour. Blend in the coconut and almond extracts. Place pan on a baking sheet and bake at 325 degrees for 85 to 90 minutes. Test cake with a wooden pick or skewer. Cake is done when dry crumbs or no crumbs come out on pick when inserted into the thickest part of the cake. Cool on a wire rack 20 minutes before inverting on serving tray. Recipe from Paula @CallMePMc.com All images and content are copyright protected. 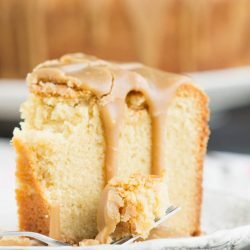 Please do not use my images without prior permission that includes copying the ingredient list or entire recipe and posting in the comments on Pinterest. If you want to share this recipe, please simply link back to this post for the recipe. What about loaf pans? I have four of them. Would that work just as well? Making this for my moms birthday! How would timing be with a loaf pan? I am planning to do the same for now. I would divide the batter equally into two 9×5-inch loaf pans. At 325 degrees I’d start checking it in the center at 45 minutes. This looks amazing! I want to make this for my son’s birthday, do you think I’d need to double the recipe to have enough batter for three 9″ pans? (I want to make a three tiered cake). Thank you! No, you’ll have enough batter without doubling the recipe for 3 9-inch cake layers. What is a tube pan? I have a bunt pan…sorry about the spelling! Can’t wait to make your beautiful cake!! A tube pan has the smooth sides and comes in 2 sections. A bundt pan is fine to use, BUT it needs to be a deeper one (about 4 and 1/2 inches tall and 16 cups). Most bundt pans are about 3.5 inches tall or 12 cups. This cake has a lot of batter. Then we did a thin glaze of 1/2 cup of confection sugar to 3 tablespoons to coconut rum an drizzled over after cake cooled AMAZING!! 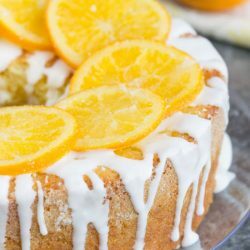 You call this your Sour Cream Coconut Pound Cake yet I don’t see any sour cream in the recipe. 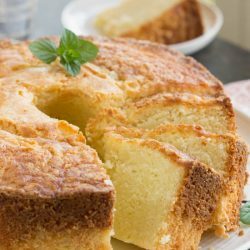 This recipe says it’s Cream Cheese Pound Cake. Is there supposed to be another recipe here? 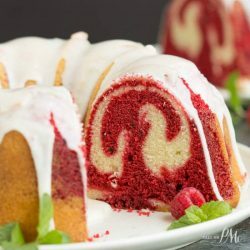 What this recipe work in a bundt pan? Why don’t any of your pound cakes use some baking powder or baking soda..??? ?